Kate Tym and John Knowles of It’s Not Us Theatre Company are back for a third year running with sell-out show A Penny Pincher’s Christmas Carol. 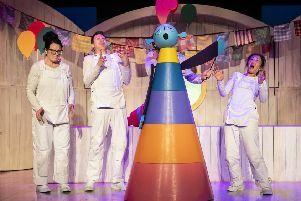 The show which is a spin on the traditional Charles Dickens’ story was first performed in Christmas 2016 and ended up being raved about by audience members of all ages. John plays Scrooge and Kate plays all the other parts. There is a performance at The Albion, George Street, on Wednesday December 12 at 7.30pm, then at Hastings United Football Club on Thursday December 13 at 7.30pm. Tickets Adult £12, Conc £9, Carer £5, Family ticket £32 (2 adults 2 kids/1 adult 3 kids). More info from www.itsnotus.co.uk.